After announcing the Snapdragon 845 earlier this month at the Snapdragon Technology Summit, Qualcomm’s line-up for 2018 has just been leaked. 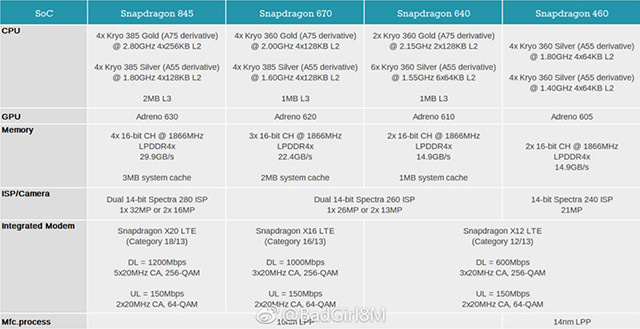 The Snapdragon 670 is expected to come out with the Snapdragon X16 LTE modem that will afford it downlink speeds of 1000Mbps and uplink speeds of up to 150Mbps, whereas the Snapdragon 640 and the Snapdragon 460 are expected to come out with the Snapdragon X12 LTE modem, with downlink speeds of 600Mbps and uplink speeds of 150Mbps. The Snapdragon 670 and 640 will come with a Dual 14-bit Spectra 260 ISP, allowing smartphones with the SD670/SD640 to include either a 26MP single camera, or a dual 13MP+13MP setup. The lower-end Snapdragon 460, on the other hand, will come with a single 14-bit Spectra 240 ISP, and smartphones that pack in the SD460 Mobile Platform will only be able to support a single 21MP camera set-up at the most. Other than that, the leak claims that the Snapdragon 670 will be built on the 10nm LPP process, which means that it’ll be more power efficient than its predecessor — the Snapdragon 660. 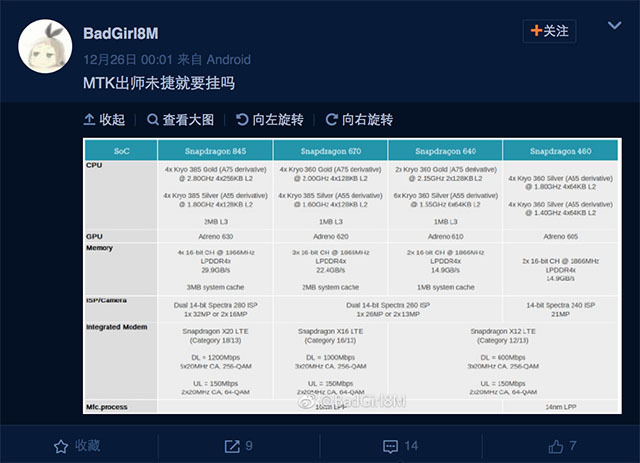 The Snapdragon 640 will also be built on a new 10nm LPP process for improved efficiency. However, the Snapdragon 460 will be built on an older 14nm LPP process instead of the newer 10nm process.